The standard of umpiring in the Indian Premier League (IPL) 2019 has raised quite a few eyebrows and some of the biggest names of Indian cricket, including Virat Kohli and MS Dhoni have lashed out at the goof-ups that the on-field umpires have been committing. The ongoing match between the Kolkata Knight Riders and the Delhi Capitals at the Eden Gardens in Kolkata witnessed yet another umpiring howler which led to Andre Russell venting his anger at the umpires for failing to spot a clear no ball which could have led to an extra ball in the over with him on strike. It all happened during the penultimate ball of the 17th over when Chris Morris bowled a high full toss to the big West Indian who clobbered it over deep square leg for a maximum. Replays however showed that the ball had been delivered above waist height and should have been called a no ball. Russell knew it as soon as he made contact with the ball and he looked towards the square leg umpire to signal the no ball which could have led to a free hit delivery at a crucial juncture during the match. Both the umpires however were unmoved and Russell could not help but vent his frustration at them for the decision. 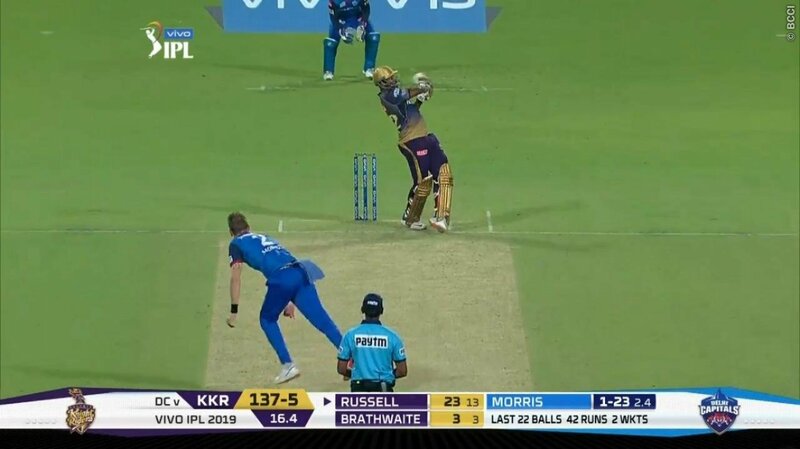 The next ball from Morris went for just a single making sure that Russell and KKR had to settle for just 10 runs from the 17th over. It was a huge reprieve for the Delhi Capitals as Russell was in fine hitting form and could have deposited the extra delivery from Morris into the stands quite easily. Meanwhile, it was another normal day at the office for the big Jamaican whose 21 ball 45 helped the Knight Riders post 178/7 in their 20 overs after being put in to bat by the Delhi Capitals. Joe Denly, playing his first match of the season, was asked to open the innings for KKR in the absence of both Sunil Narine and Chris Lynn, got out for a golden duck on the very first ball of the over. Shubman Gill, who was promoted up the order to partner him, top scored for KKR with 65 off 39 balls with the help of 7 fours and 2 sixes as the home side set a target of 179 for Delhi to achieve in the second innings.